“My great-great grandfather, Rufus T. Breckenridge III was perhaps the most prolific liar and storyteller in the history of verbal communications. Either that or he had somehow acquired in his vast travels the unnatural ability to be in a number of different places simultaneously.” This opening statement from the introduction to The Potentate of Walking Horse alerts the reader that a fun-loving, laugh-out-loud, maybe a little dark but always entertaining, journey through the Old West is about to begin. This story, set in the 1880s and ‘90s, is narrated by Rufus T. Breckenridge III on his 100th birthday. Charging straight ahead from one adventure to another (sometimes under the guidance and protection of an unknown power) this tongue-in-cheek account of how the West was really won will have the reader turning pages faster than a bottom-of-the-deck draw in a crooked poker game. Gary Lendennie, author of this uniquely endearing novel, blends fact with fiction so well it’s almost impossible to tell where one stops and the other starts. Moonshiners, space aliens, cannibals, robots, Indian magic and ambitious politicians, all play a role in this one-of-a-kind adventure. So saddle up, load your six-shooter, and enjoy the ride. Starting in Reno in 1890, Rufus T. Breckenridge III, an unlikely hero whose mission in life is survival, exacts revenge on a former partner, a half-breed Indian named Willie Snowshoe, and is surprised by a vision that appears just in time to save his life. After the town marshal insists he take up residence elsewhere, Rufus T. hits the road where he befriends some Shoshoni Indians, encounters a space ship on the Nevada desert, and eventually hires on as a cowboy at a small ranch near Colorado Springs. After only a month, he has a run-in with the ranch foreman and finds himself on the road again – this time he heads south for the warm climate of Fort Worth. There he meets a mentor, Texas Martin, who schools Rufus T. on the skills of deception, outright fraud, and how to lie when caught red-handed. In Fort Worth, while earning a dishonest living helping Texas cheat at cards and other activities, Rufus T. gets involved in a gunfight with an old acquaintance from his past. Again, a strange power intervenes to save his life. He is ordered by the sheriff to leave town and is told, “I hear Arkansas is nice this time of year.” Having been kicked out of Reno, Colorado Springs and Fort Worth, our hero wanders into Arkansas where he comes upon an old Indian sitting inside a circle of animal bones; facing the morning sun in full battle dress and singing what Rufus T. believes is a kind of death chant. His name is Two Dogs; a Cherokee elder who has taken a solemn vow not to speak again until after he has met and defeated Death in battle. Rufus T. thinks the old warrior is disturbing the peace and quiet with all his caterwauling. Angered by the appearance of a White man at his holy ceremony, a dispute erupts. However, fate has brought them together, and despite their differences they find themselves traveling the same path – although neither one has a known destination. One morning they top a rise in the plain and see a small town resting peacefully in the distance. The town is Walking Horse, Arkansas, and upon seeing it a strange feeling of contentment settles over them. Two Dogs touches his heart, then moves his hand out and away, giving the Indian sign for warmth and good feeling (friendship). Rufus T., who has been schooled in the ‘signs’, sees the gesture and nods his agreement. Somehow they know this quiet little town is what they've been searching for. What they don’t know is that this quiet little town is an experiment, established 100 years ago by extraterrestrials, and that a spaceship is on its way to earth to terminate the experiment. A series of comical situations, which serve to describe the character and attitude of the people of Walking Horse, lead them to August 2, 1895, two days before the towns 100th birthday. Five miles outside the town is Tyler Valley, 50,000 acres of rich farm land shaped like a huge bowl – flanked on three sides by mountains and across the western edge by Nolan's Ridge. Under the cover of darkness, the spaceship drifts into position over Tyler Valley, causes it to fill with water, and submerges there to hide while the occupants go about their business. 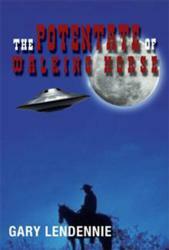 With the arrival of the Potentate aboard the spacecraft, the future of Walking Horse, Arkansas is in serious doubt. Can our hero save the town? Gary Lendennie is the CEO of GG Publications, Inc. a newspaper publishing corporation in California. Gary graduated Hawthorne HS in California in 1962 and joined the Marines in 1963. He served in Viet Nam and received an honorable discharge from active duty in 1967. While working as an aerospace engineer, he majored in Journalism at a local college and started a weekly newspaper. Gary now oversees three weekly newspapers under the GG Publications banner. His next book, The Communications Gap, is an account of his experience in the Marines. The Communications Gap will be available in book stores and e-books in early spring. Members of the media who wish to review this book may request a complimentary paperback copy by contacting the publisher at (888) 795-4274 x. 7879. To purchase copies of the book for resale, please fax Xlibris at (610) 915-0294 or call (888) 795-4274 x. 7879. For more information on self-publishing or marketing with Xlibris, visit http://www.Xlibris.com. To receive a free publishing guide, please call (888) 795-4274.